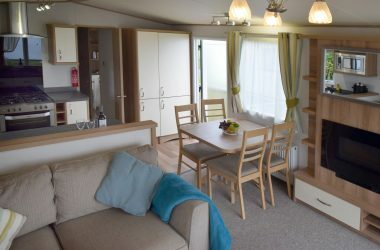 Find all the space you need in this large and luxurious 2 bedroom caravan… The extra length gives this comfortable caravan a lovely open-plan living space. 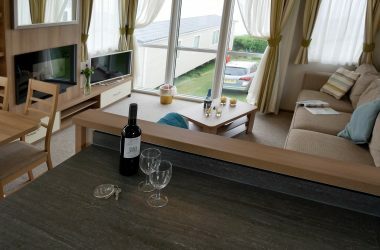 The many windows let in the lovely sea views, and mirrors help to make this generous caravan seem even more spacious. The living room is coolly relaxing in summer, and cosily inviting in off-season months, with a fully-fitted kitchen that’s a pleasure to cook in. The bedrooms are well-designed with lots of storage – and the en-suite to the master bedroom is a welcome addition. The perfect caravan if you like that bit of extra space. 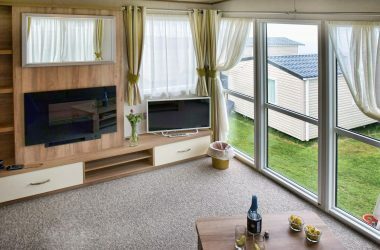 Ayr Holiday Park is close to the centre of St Ives, and it’s a lovely walk down to the town and beaches. In the other direction, you can pick up the South West Coast Path from the holiday park, so you’re just moments away from spectacular clifftop scenery. You can find the lovely Garrack Hotel is next door to the park. We own and manage this welcoming hotel, Ayr guests are permitted a dip in the indoor swimming pool (for a small charge) which is perfect for the kids, and enjoy fantastic Cornish produce in the poolside café bar or AA Rosette awarded restaurant, perfect for an evening meal.